Enterprise licensing – Single point automation solution for organization. Your single point Efficient Automation Partner – Infusing efficiency through Innovation. Please talk to us to enterprise level automation offering. Many organization is on enterprises licensing. AUTOSPOOL is an automatic piping and spooling software used for generating Piping Fabrication and Erection Isometrics and related Reports based on Fabrication / Erection site Requirements, Best Practices of International Fabrication, Client Requirement Standards. is a piping spool, material and construction management software at shop/site useful for effective matching front analysis, work allocation, material allocation, piping material control and tracking. Piping Fabrication yard/shop automation software for Activity level Project Management, Planning and Control, Progress Monitoring, Material Management and reporting at various stages of Piping Fabrication. is an Erection of Pipeline, Material and Construction Management software at shop/site useful for effective matching front analysis, work allocation, material allocation, piping material control and tracking. Piping Erection site / yard automation software for Activity level Project Management, Planning and Control, Progress Monitoring, Material Management and reporting at various stages of Piping Erection, Test pack clearance, system Pre-commissioning and Commissioning of units / plants. MATCONTRK is material control & tracking from Engineering to Procurement to Construction, Look Ahead plan for fabrication and Erection. 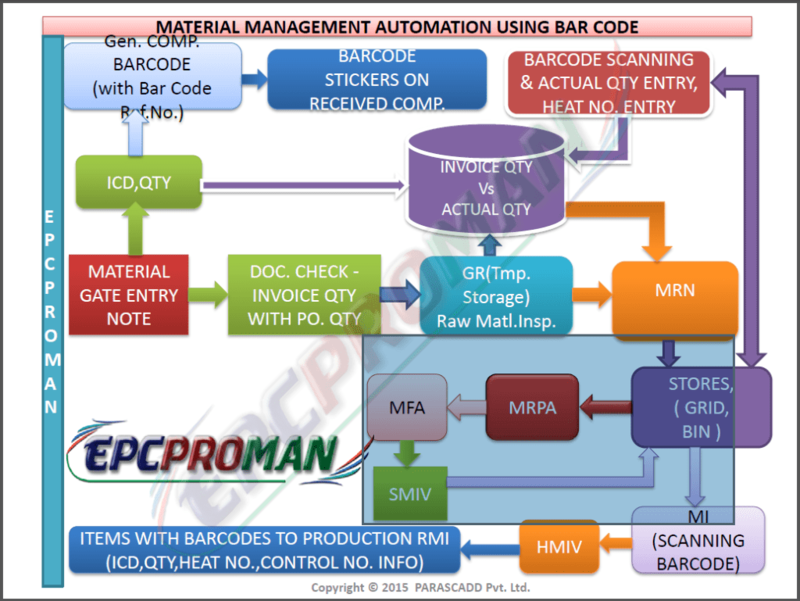 Organized inventory with perfect material tracking, Right material at right place at right time. 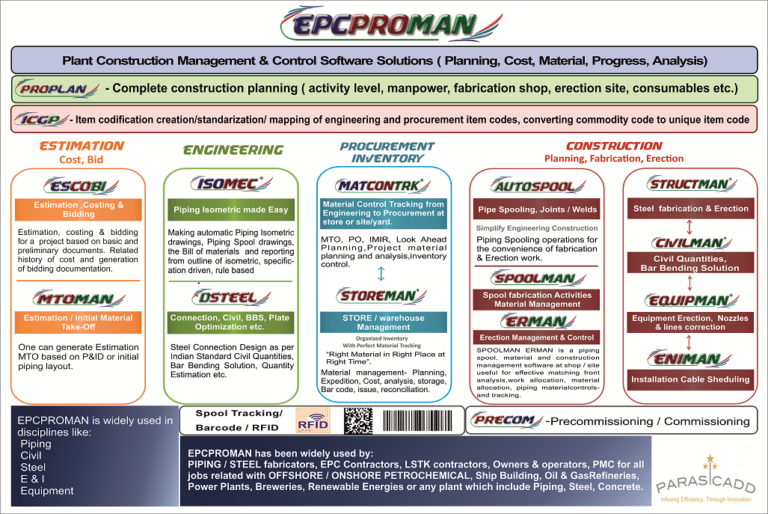 STOREMAN is a complete solution to manage all the store functions for Piping, Structural, Materials Speciality & Tagged Materials, Structure / Concrete, Equipment, E & I etc. 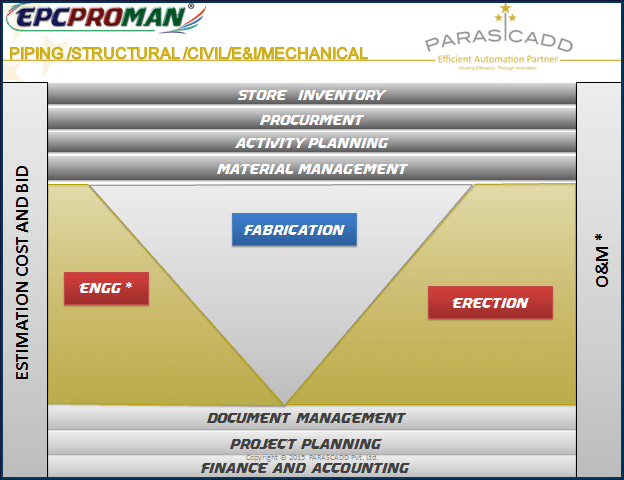 STRUCTMAN is a software to handle the entire activities in steel construction. They include procurement, inspection, storage, fabrication, lay-down, erection, painting, etc. The progress of various activities is monitored and reports generated showing the status. CIVILMANis a software to handle and monitor CIVIL construction work from beginning to end. All the necessary activities involved in CIVIL construction are included, recorded, their precedence, progress and completion is monitored. Any new activities if required, can be added. EQUIPMAN is the software solution for managing all the Equipment related activities in the Project. ENIMAN is used for managing all the Electrical & Instrumentation related activities in the Construction Project. TURN HOURS REQUIRED FOR PIPING ISOMETRIC IN TO JUST A FEW MINUTES. ASME B 16.5 – 2013, ASME B 16.9 – 2012, B 36.10-2004 , B36.19-2004 etc. If you have a requirement of a specific standard and those are not supplied with the software we can build it those standard or non-standard items in the existing catalogs. Or one can also create company-specific catalogues on their own using AUTOSPEC module. DSTEEL is a software for design of connections in the structural steel works. With the involvement of the engineer, the software helps in getting an economical and practical design. This software covers all industry requirements. It is based on codes. Various provisions of codes are available for reference as the context-sensitive help and reference clauses are mentioned in the reports. The project specifications can also be used to control the design requirements.